Overall size: 19" x 25"
The 13th Aero Squadron was the first American Army Air Service Squadron to be equipped with the new 220 H.P. SPAD XIII fighter plane, one of the most advanced aircraft of the time. 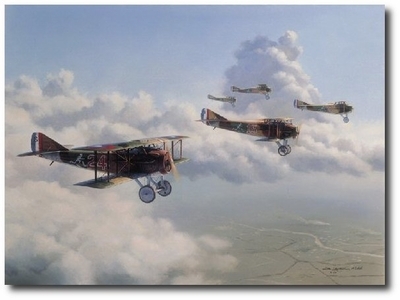 A five ship "vic" comprised of some of the 13th's top Aces as depicted flying a patrol over France in 1917.